Are you the sort of person who gets motivated because of games that offer simple rewards for achieving small goals? For example, are you encouraged to get up off the sofa and go for a short walk because you don’t want to lose your Pokemon Go streak? If you find these sort of games work for you, and you’re a writer struggling to hit your word count, I would like to recommend http://4thewords.com. This is a web-based game that lets you fight monsters by writing. When you sign up, you are introduced to a fantasy world location and assigned quests to complete. These quests usually involve collecting enough of a certain item, but there are some that involve fighting a specific boss monster or maintaining a streak of number of days in a row you’ve written. When you choose to fight a monster, the game starts a timer. The timer could be for as short as 30 minutes, or you could get several hours for the tougher monsters. You also get a word count to achieve. You can create files and write in them using a basic word processor page on the site which saves your work every few seconds and keeps an updated view of your word count. You can also see the status of your battle – how much time you have left and how many words you have left to write. 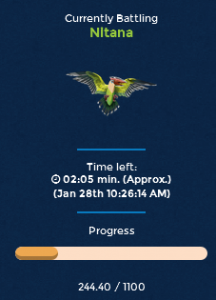 As you write more words, the progress bar moves up until you reach the target. Then you get your “reward”. The game offers you reward items that you can use to complete quests or give you bonuses to your battles. As well as competing with the fictional monsters, you can compete with other users on the site. 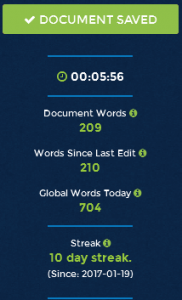 The site has leaderboards that let you see how other users are doing in terms of their total word counts, the number of battles they’ve won, and the length of their writing streak. You can see how you stack up against other players and try to climb to the top of these leaderboards. All your work is saved as files on the site and you can group those into sections and projects – so you could have a project be a story and each file be a separate chapter. You don’t have to do all your writing in one file for a battle; you can jump between files as often as you like as you strive to reach your word count. There’s no rule saying that what you write has to be fiction. As long as you type it in their webpage, it could be anything at all. For example, I’m actually writing this blog post in 4thewords right now. From a legal/copyright perspective, all your words are your own. The creators of the site don’t take ownership of any of it, and you can always delete files later if you want to take them off the site. While you’re working on your writing, the files are private, but you have the option to “publish” the files, which makes them visible on the site to other users. You can go into this section and find things that other people have written available for you to read and rate. The site is still being developed. Since I joined 10 days ago, they’ve launched a forum so you can have discussions with the other writers using the game. I’m sure there will be more features added as the game grows. There are just a couple of things to note. One is that there is no easy export option. I wish there was a simple way to click a button and download my writing in a Word file, but there’s not. Still, it’s not the end of the world and there’s always copy/paste. The other thing to note is that this is a paid for game. 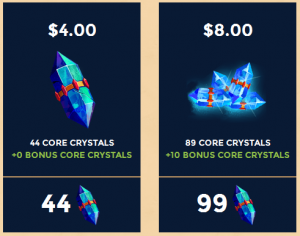 You get the first 30 days for free but after that you have to pay for “core crystals”. It costs $4 to get enough core crystals to pay for a month’s membership, but these are in game objects and you can actually get some of them for completing quests. Combine this with the fact that you can buy bundles of core crystals and get a better price for buying in bulk, it could end up being significantly cheaper than $4 if you play regularly. The free trial doesn’t require a commitment (no one’s going to ask for your credit card number or anything), so you can try it out and see if it motivates you to write more. If it doesn’t, you’ve not lost anything. If it does, it’s up to you to decide whether you think it’s worth $4 to you. Edit: when you sign up, if you enter the referral code DFXRI67115 you will get 20 bonus core crystals, which is nearly half the month’s cost, so you won’t have to pay the full amount for your second month. I didn’t realise when I first started this book that it was part of a series, but it quickly became apparent. The book jumps in without any real introduction to the main characters, the world-building, or the events that led up to this point. It was very hard to figure out what was going on for the first couple of chapters because the characters would talk about things that happened in a previous book without there being any additional explanation for those readers who hadn’t read that book. It got easier after about four chapter when I’d figured out the basics of what was going on, but there were still moments throughout the book when knowledge of the previous book was just assumed. For example, a character was brought into the story who’d not been so much as mentioned in this book, and I was left with no idea who this person was. I realise it’s a delicate balance when writing a sequel as the author doesn’t want to bore readers who have read the first book, but I thought this one could have done with a little more background explanation. Still, that’s probably not an issue if you read the books in order. The Fallen Gatekeepers is a fantasy story about other worlds inhabited by gods, and the gatekeepers, an order of warrior girls who protect the gods from Evil Ones. Junya is a teenage boy who has been caught up in this world of magic and gods. He is determined to help the gatekeepers fight the Evil Ones, but he also wants to spend more time with Shoko, a gatekeeper of great skill. When the Evil Ones start attacking Shamans, Junya and Shoko must break with tradition and come up with a new plan to fight them. There’s a lot that’s good about this book. The plot is interesting. There were some nice twists and turns that kept me reading to figure out what might happen. The plot was cleverly constructed and was what held my attention to the end. There are some nice underlying themes about jealousy and the desire for material things which add a layer to the book without coming across and preachy. It comes through the book in a very natural way and feels understandable in the reactions of the characters. I liked the character of Mack, one of Junya’s friends, and there were some interesting dynamics between some of the gatekeepers who work with Shoko. There are a large of range of characters, both major and minor, who all feel like different people with their own desires and goals. My main issue with the book was that Junya did some things that annoyed me. He frequently checks out women and girls in the early part of the book. This starts with watching Shoko getting undressed when she’s taking a bath but also includes ogling at women who work for his grandfather. There were also some sexist traditions in Shoko’s world that it would have been good to see Junya call out. When discussing what happens if a girl gets pregnant – she loses her position and her honour, but the boy who impregnated her isn’t punished – Shoko dismisses this as being because the elders know what young people are like, especially boys. This is a “boys can’t help themselves” argument that I find infuriating and it would have been nice for Junya to address it instead of letting it slide. Junya is also obnoxious about money. He has a large amount of money thanks to the events of the previous book (he talks about millions of dollars in a stock account at one point) and he does things like throwing half a million dollars on a fancy car just because he can. Then he goes and talks about wealth inequality and how it isn’t fair that a small minority has so much money – despite being part of that small minority. If he was ever shown being generous with his money it would be fine, but these statements come across as hypocritical given his behaviour in the rest of the book. This could have been easily fixed with an aside mention of charity donations, or an extra sentence to say that he paused to give money to the homeless people he passes while walking with Shoko – instead the homeless people are mentioned and Junya just walks right by. This is especially grating given the message the books shows in other places around how desiring stuff for stuff’s sake can be damaging. The other thing that annoyed me at times was the way other countries and cultures were portrayed using stereotypes. Japan wasn’t so bad because there were enough different Japanese (or Japanese-inspired) characters that they could have different personalities, but the way the ninjas were written or the girls wore school uniforms and so on did feel like stereotypes at times. But other countries get only a very brief mention and they come across as ridiculously stereotyped – such as the tribesmen of Africa (the land of big cats and elephants – even though this description might apply to India), or the clansmen of Scotland (the land of druids – even though this could apply to Ireland, Cornwall, Wales, etc.). In the exchange with the Scotsmen, Shoko uses a few phrases with local dialect wording and Junya talks about how she’s “talking Gaelic” even though she’s actually speaking English. The scenes in Africa and Scotland were quite short in the book, but they still grated because they felt very stereotyped. The plot of the book and the ideas behind it were very interesting, but it was the details of how it was written that annoyed me. I feel like I’m being quite harsh in this review – I did enjoy reading the book after all. I probably would have enjoyed it more if I’d read the first book in the series before coming to this one. If like me, you come to this book without having read this series, I’d suggest going for the first book before coming back to this one.